The Alice Cooper ‘Theatre Of Death’ production is about to hit the road again, kicking off in Canada with Rob Zombie for the ‘Gruesome Twosome’ tour extravaganza. A lot of great European festivals are on the books as well, current countries include UK, Germany, Belgium, France, Spain, Norway, Sweden, and Finland! 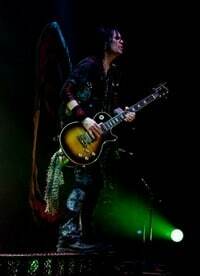 Alice Cooper guitarist Keri Kelli will be offering 1 hour, one-on-one, guitar lessons daily on the tour. These lessons will now include ‘Play-Along’ CD’s with Various tunes and all the exercises/theory covered in the lessons. If interested please check www.kerikelli.com for more info. Also, Keri Kelli skate decks are now here! Orange County has been synonymous for skateboarding so KK decks were in order. Zip-up hoodies are also new in the store as well as ‘Saints Of The Underground’ autographed CD’s. Please stop by the KK merch area to see whats new.